Good day to everyone, welcome to another exciting review of atomic wallet review on my blog. Today, I will be reviewing the mobile version of the wallet. N.B: the mobile version of the wallet isn’t available yet for download by the masses as it is still in its testing stage, however you can also become a tester by filling this Google form and the download link will be sent directly to your registered email address. Like I have said earlier, this mobile version is still in its testing phase, that is the reason behind its in-availability for download by the masses. Almost all the features present in the web wallet are also present in the mobile version; it’s just a unique way of making our cryptocurrency assets management very handy. All thanks to the atomic wallet team. The picture below shows the mobile wallet interface with various assets listed therein. Users can perform several actions on each asset just like in the web wallet, actions like sending and receiving of the token/coin, and also checking of transaction history. 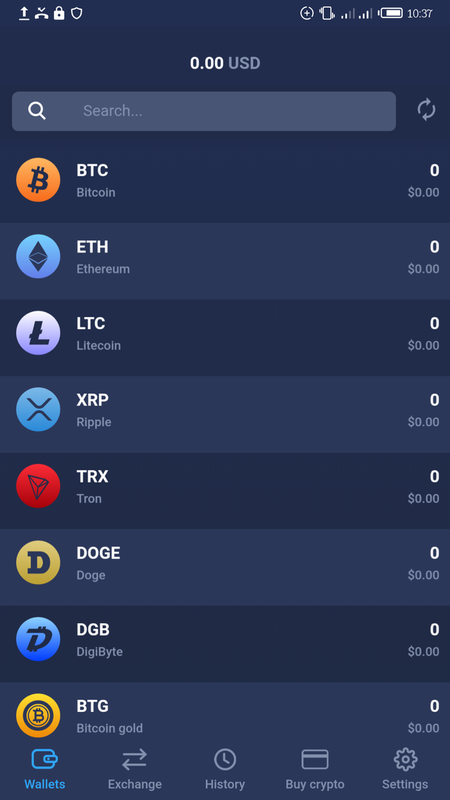 You can search for a specific token/coin of your choice inside the wallet by clicking inside the search space and type the name of the coin/token and instantly, it comes up. Refresh your individual and total tokens balance by clicking on the refresh icon on the top right corner of the wallet. 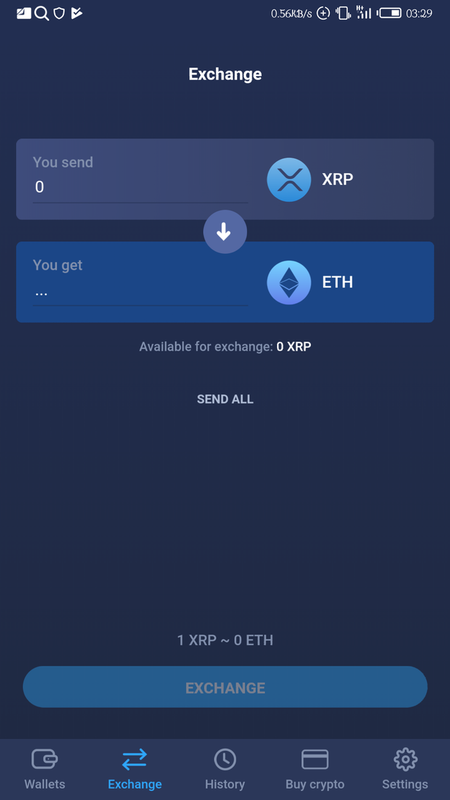 Just as it is in the web wallet, there’s also exchange feature inside the atomic wallet mobile application. Just click on the exchange tab and it takes you to the exchange page where you can easily swap your tokens into other tokens. The token on top as shown in the picture above is the token you wish to change. You can choose other tokens/coins by clicking on the token symbol and select any other token of your choice. The token below is the one you’re swapping into ad you can also change it by clicking on the token symbol and choose your choice token as well. Thereafter, you can click on exchangeand your tokens will be exchanged accordingly. The exchange rate is being displayed beneath. Check all your transactions history by clicking on the history tab displayed beneath the wallet and your transaction history come up instantly. Purchasing of tokens via credit card is not yet made available in the mobile wallet, however, you can easily make use of the feature in the web version of the wallet. Another interesting aspect of the wallet is the settings page which gives you utmost protection of your assets. 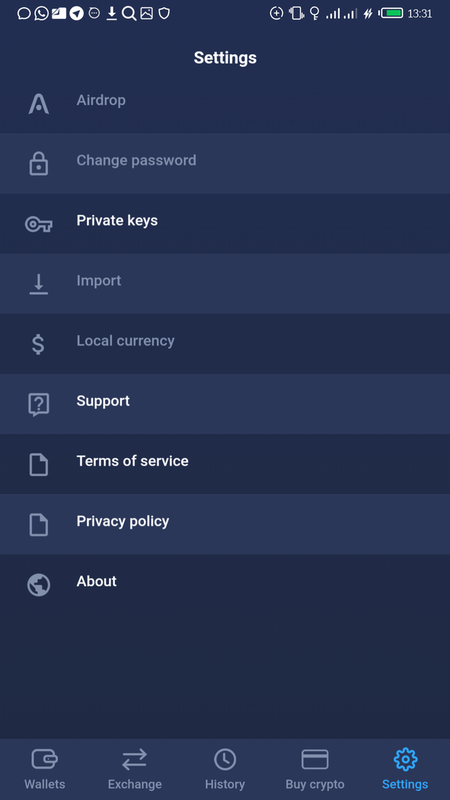 Import your private keys and back up phrase by clicking on the Private keys option and it displays a page for entering your wallet password after which all your private keys can be checked and copied at a glance. Click on the support link in order to visit the support page. There are lot of features which are yet to be unlocked in the mobile wallet and hopefully will be made available in the future updates of the application. Conclusively, atomic wallet team are conscious of the problems being faced by lot of cryptocurrency users and has come up with a lasting solution through its wallet both for PC and mobile users thereby making cryptocurrency assets management easy for everyone. You can also become a tester of the mobile application by filling this Google form.